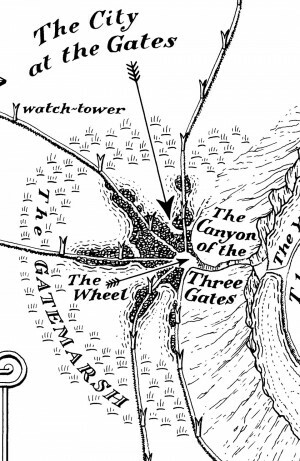 The City at the Gates is so named because it lies at the gates of Osrakum. Built on land reclaimed from the Gatemarsh, it has at its heart the great market of the Wheel. From here the five raised roads radiate out across the Guarded Land. The habitations of its almost three million citizens spread out along the causeways that carry the roads with their watchtowers. From the Wheel the Canyon of the Three Gates leads into the crater of Osrakum. It is on the edge of the Gatemarsh that Carnelian and Osidian spend their first night with the slavers in their camp.